The journal Nutrition found that medical students who didn’t eat breakfast were more likely to be fatigued. And according to research reported in the Journal of the American Dietetic Association, people who skip breakfast can be more exhausted and irritable than those who don’t. Eating breakfast makes you more productive and can even help to improve your memory. Try to plan what you’re going to eat in advance. You can even write yourself a note the night before and stick it on the bathroom mirror or the refrigerator. Here are a few suggestions for healthy breakfasts: banana (or any fruit), instant oatmeal (e.g., Better Oats — www.betteroats.com), low-sugar cereal and skim milk (Shredded Wheat with berries). Yogurt is packed with lean protein (nearly 30 percent of the recommended daily value) and calcium (nearly 25 percent to 40 percent of the recommended daily value). Need to eat on the run? Try Dunkin’ Donuts Egg White Veggie Flatbread (280 calories) or the Egg White Turkey Sausage Flatbread (280 calories). Starbucks has The Perfect Oatmeal for only 140 calories with 4 grams of fiber – and it’s very tasty. Just avoid the added sugar topping and the dried fruit. You can also try Starbucks’ Strawberry Blueberry Yogurt Parfait for 290 calories or the Spinach & Feta Breakfast Wrap made with egg whites for 290 calories. Their Reduced-Fat Turkey Bacon with Egg Whites on English Muffin is 320 calories. You might even try to create a weekly menu along with a shopping list. Choose whole-wheat breads, rolls, pitas, English muffins and tortillas. You can vary the type of bread to keep lunch interesting and appealing. For filling, use lean luncheon meats, such as turkey, ham or roast beef, rather than bologna, salami or bacon. Add vegetables such as lettuce, tomatoes, cucumbers or peppers. Salads: Buy prepackaged bags of salad and keep them in your cooler, then add your low-calorie dressing at lunchtime. Or buy McDonald’s Newman’s Own Low Fat Balsamic Vinaigrette at only 40 calories per packet. The packets cost about 30 cents each at McDonald’s and are not sold in all stores. Avoid nuts, croutons, noodles and creamy salad dressings. Chicken, Turkey and Sushi: All of these can be eaten cold. With chicken and turkey, opt for white meat and remove the skin, which has most of the fat. Sushi is sold in many supermarkets in plastic containers perfect for taking “to go.” (If you’re buying raw fish you’d better be sure it’s kept cold!) Choose vegetable rolls (such as California or cucumber) to get fiber and flavor for fewer calories. ( www.shopfitandfresh.com), LunchBots ( www.LunchBots.com ), To-Go Ware (http://www.to-goware.com/), Lunch Sense lunchbox (www.lunchsense.com) and Aladdin (www.aladdin-pmi.com). You can buy your own mini-fridge or freezer (if you have the space) and stock up on healthy frozen meals (e.g., Healthy Choice, Smart Ones and Lean Cuisine) and soups with less than 120 calories per cup and then heat them in the company microwave. According to a survey by the American Dietetic Association and ConAgra Foods’ Home Food Safety program 83 percent of you eat at your desktop. The problem is that many desktops are filled with bacteria that can lead to foodborne illness. Here are the ADA’s recommendations: Make sure to wash your hands, keep your office fridge clean and below 40 degrees Fahrenheit. And when using a microwave, make sure that all the food is heated correctly. Don’t be embarrassed about making special requests. You are the only one who will suffer if you don’t. – Limit mayo, tartar sauce, creamy dressings and extra cheese. – Ask for dressing, sauces, butter or sour cream on the side. – Watch nuts, croutons and other salad add-ons. – Chicken and fish are good choices only if they’re grilled or broiled, NOT breaded or deep-fried. – Avoid large portions. Split your entrée with a co-worker, or ask for a half portion. – Read the menu. Avoid any of the following words: a la mode, au gratin (covered with cheese), battered, bisque, breaded, buttered, cheese sauce, creamy or rich, crispy, deep-fried, deluxe, fried, hollandaise (sauce made with butter and egg yolks), jumbo, nuts, scalloped, sautéed (unless you make a special request for it to be prepared in a small amount of oil) and tempura. – Don’t be afraid to ask questions or make special requests. -Liquor is fattening and also causes you to eat more by lowering your inhibitions. Healthy snacks help to ensure that you have enough fuel to keep going throughout the day. Try nuts, which are nutrient powerhouses; air-popped popcorn or healthy bars such as CLIF C Bars, made exclusively from organically grown fruits and nuts, or Larabars. Clearly, the best snacks are fruits and veggies. Keep a bowl of fruit on your desk. 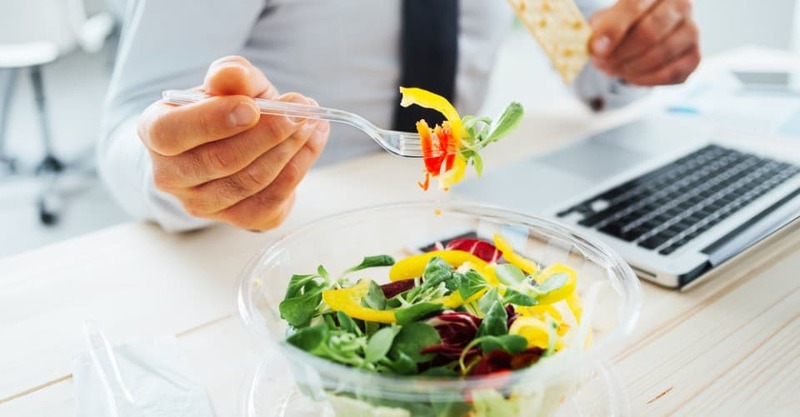 You might even wind up encouraging others in your office to “snack healthy.” Research shows that you eat more than twice as much food when it’s left out on your desk as you do when it’s kept behind closed doors. So keep candy and other unhealthy snacks out of sight. Learn to seek out healthy alternatives in the vending machines. They’re becoming more and more common. Some vending companies even mark the healthier options, including real fruit – try to get your company to change what’s in their machines if they haven’t already done so. If the healthier options are not clear, choose the nuts or seeds. There’s strength in numbers! Team up with a co-worker who is also determined to lose weight. An office diet buddy can provide you with emotional support and reminders. Exchange recipes. Share information by taking turns looking up nutrition facts about a food you both like and help one another make better and more interesting choices. Most offices are breeding grounds for nibbling just because the foods are there. But a nibble here and there can easily add up to more than a meal. To combat temptation and empower yourself, set some ground rules, and have alternatives or limitations set up in advance for celebrations involving cookies, pizza or bagels.